Consumers in the UK should expect a revolution in the way they pay for things in the near future, according to payments association Apacs. The cheque, which is 350 years old on 16 February, is said to be in irreversible decline as innovation points towards a cashless society. Banks will increasingly battle for a consumer to use one card exclusively. But as consumers prepare to pay and access accounts using their mobiles, retailers are worried costs will rise. By 2015, the number of payments made by cash in the UK will be overtaken for the first time by other ways of paying, according to Apacs. At the end of this year, three million Barclays customers will be able to press their debit card to a sensor in more than 8,000 UK shops to register a payment. Meanwhile, the UK could mirror technology already used in East Asia where the chip now found in a plastic card is placed in an everyday item such as a mobile phone or a watch. This is then pushed against a sensor in a shop to pay, and is known as "contactless" technology. Fingerprint recognition is already being used. Some children press a digit to a sensor to register when they have a school dinner. And Mastercard plans to allow people to pay their bills through messages on their mobile phones. But Andrew Bailey, chief cashier at the Bank of England, told the BBC that notes and pennies would still survive the test of time. "I do not see the banknote dying out in the next ten years. It is not just me saying that because I sign them; there is a demand that I can't see going away," said Mr Bailey, whose signature is on every banknote. The future of the chequebook is far less secure, with numerous retailers refusing to accept them and consumers increasingly turning to electronic payments instead. "Those aged in their 20s don't know what a chequebook is, and those in their 30s don't know where their chequebook is," said Sandra Quinn of Apacs. 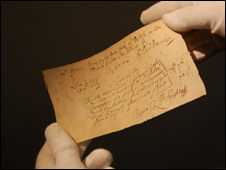 The earliest cheque in the UK was thought to have been written 350 years ago, dated 16 February. It was made out for £400, signed by Nicholas Vanacker, made payable to a Mr Delboe, and drawn on Messrs Morris and Clayton - scriveners and bankers of the City of London. The cheque's predecessor was the bill of exchange - a way for traders to buy and sell goods without the need to carry cumbersome and valuable quantities of gold and silver. 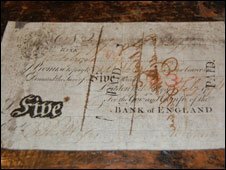 In the early days, cheques were used relatively infrequently, mainly by merchants and traders for high-value transactions. They had to be confident that these handwritten pieces of paper could be guaranteed. So they were often issued by goldsmiths within a local network of traders who knew and trusted each other. Printing processes meant they started to be used by customers of commercial banks, peaking a generation ago in 1990. However now they are used for things like paying tradespeople, or by parents paying for children's school meals or trips. Cheque volumes fell at their fastest rate ever in 2007, down by 10%, with personal cheques accounting for only 6% of all personal non-cash transactions. The payments industry discussed the possibility of phasing out cheques in the UK by 2018, but concluded that the alternatives had not developed sufficiently. As well as electronic transfer of funds on the internet, the most likely replacement for the cheque is mobile payments. A phone number acts as a proxy for a bank account number. So instead of paying, for example, the plumber by cheque - he or she could be paid by an exchange of text messages. When new technology affects banking services, consumers are naturally concerned about security. Where do we spend our cash? Contactless cards will have a limit of £10 for each transaction. Occasionally, cardholders will be asked to enter their Pin, as they will for purchases above £10. No cash-back will be available. The card provider covers any losses if a card is stolen and the customer reports the loss at the earliest opportunity and does not act negligently. The providers also say it is impossible to clone and any intercepted data would not work if an attempt was made to use it. The decline of the cheque has slowed owing to security measures, with some companies ensuring a dual signature on cheques to maintain internal security. A closer look at Apacs forecast for the decline of non-cash payments suggests that the move away from cheques, notes and coins has not been as speedy as they expected. Previous reports by the payments association suggested that non-cash payments would overtake cash transactions as early as 2011. Now, the prediction is 2015. Digital money has also been talked about for years and has never quite taken off, according to many experts. A spokeswoman for Apacs said that it would take time for consumers and retailers to migrate to new technology, but the move away from cash was already happening. However, the British Retail Consortium (BRC) is adamant in its view that cash has a significant present and future, especially during a recession when people are looking to budget. "Cash is coming back because it is easier to control in tough times," said Richard Dodd, head of campaigns at the BRC. He said many of the same arguments were made when credit cards were introduced 40 years ago. The Association of Convenience Stores (ACS) said that while contactless could cut the queues at busy commuter shops, such as newsagents, it feared that retailers would miss out on sales because of the £10 limit on contactless purchases. A recent BRC survey claimed that credit cards accounted for 11% of transactions, but 49% of retailers' costs in accepting them. Shopkeepers liked cash, the BRC said, because it was the cheapest to process. The biggest single cost of card payment collection was the bank merchant service charges, it said. These cost the retailer 2p per transaction for cash, compared with nearly 8p for debit cards, 35p for credit cards, and 53p for cheques. However, the BRC's figures are disputed by at least one card provider. As a result, Mr Dodd claimed that the card providers made more from retailers who took card, rather than cash, payments. I do my best to use cash for everything from flights to bananas. I don't want to be monitored, checked, controlled. He called on them to amend their charges to reflect the "true cost" of processing. The banks would dispute this view, but there is no doubt that they would benefit if their brand of card was used most frequently. This battle to be the "front of wallet" card means that the providers are pushing to have a range of features on one card. Some forecasters expect consumers to soon be able to use one card for debit, credit and transport payments, as well as being used for small transactions usually paid for with loose change. All those payments and a bank account could then be tracked on a mobile phone. All this suggests that cheques, notes and coins could be dropped eventually, but plenty of groups will be ready to challenge that particular penny pincher. 3. The terminal sends a message to the acquiring bank, which sends a message to the card operator, which contacts the card provider. Money is then taken from the customer's account to pay the shopkeeper. The whole process takes a matter of seconds and builds on the technology used for chip-and-pin.